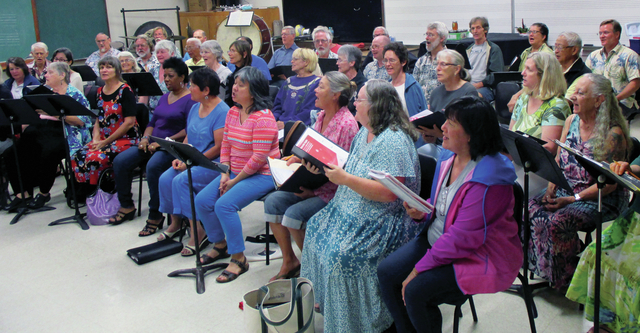 The Hilo Community Chorus will present “Appalachian Winter and Other Songs of the Season” in concert 3 p.m. Sunday, Dec. 8, at the Church of the Holy Cross in Hilo. “And, the concert begins before the concert begins,” said HCC music director Tom McAlexander. “Roland Maurer, a retired professional bassoonist/oboist from Switzerland now living in Kona, will be playing pre-concert music by Friedrich Zipp, Johann Ernst Galliard and Johann Sebastian Bach, accompanied by Walter Greenwood on organ, beginning at 2:45 p.m. The concert promises to be varied and entertaining. The music for the first half of the program consists of new carols or new arrangements of old, familiar carols, all composed or arranged in the 21st century. There will be two medleys of familiar carols; a blending of “Jingle Bells” with music from Tchaikovsky’s “Nutcracker Suite,” two new madrigals, an Irish “jig” carol and other carols, familiar and new. The second half of the program features Joseph M. Martin’s “Appalachian Winter,” music that celebrates the legacy of early American carols and hymnody, including Sacred Harp tunes, Shaker hymns, and Appalachian melodies. A “bluegrass style” consort will accompany these songs. The concert is free with calabash. For more information, call or email McAlexander at 985-7192 or tommac@hawaii.rr.com.